They’re part of the “No-Name Collection,” and they definitely deliver on that promise. Is this really a "fashion-forward silhouette?' Or just a tank top with some trim? So the brand Mitchell & Ness has collaborated with designer Don C on some vintage NBA jerseys that are … well … hmmmm. They’re part of the “No-Name Collection,” and they definitely deliver on that promise. See, there are six NBA teams represented in the part of the collection released Tuesday, with the Timberwolves’ “tree” era jerseys — worn during the KG heyday of the late 90s to mid-2000s — among them. And, um, all that’s on the jerseys aside from labels are the small green border trees and an NBA logo. No player name. No team name. No name. 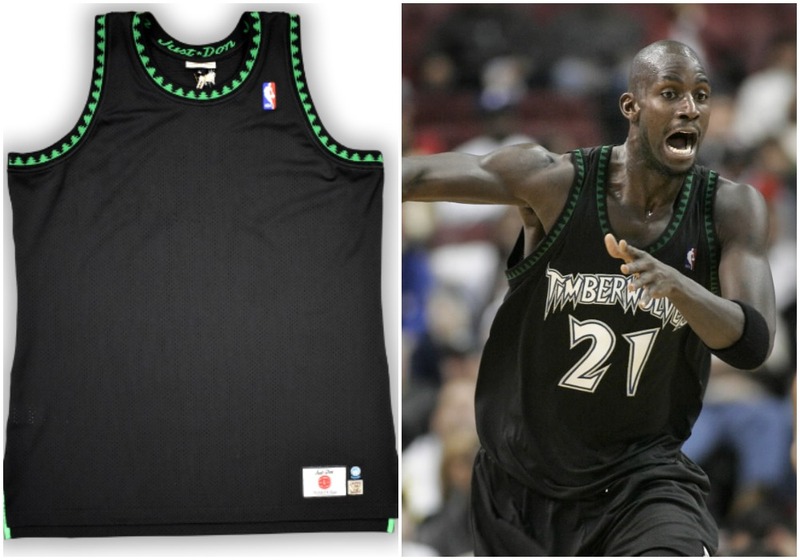 (The photo above is the jersey for sale and the actual jersey, as worn by Kevin Garnett). I’ll admit the Jazz, Suns and Warriors no-name jerseys are better. Maybe not worth $400, but I’m a dad who has stuff in his closet from last century and more jumpsuits than real suits. Designed and tailored in the United States, the “No Name” collection presents itself just as it sounds. Don has strategically removed the NBA team names on the front of the jersey, creating a fashion-forward silhouette that provides a unique take on nostalgic HWC jerseys. It’s your life. It’s your money. I get the weird psychology behind wanting something more because it’s absurdly expensive. It’s $400. Is there something wrong with me because I don’t like it? You might be the envy of Target Center next year, or you might regret a purchase immediately. I’m a dad, but I’m not your dad. Do what you want. How will change in betting law alter the Las Vegas experience? Can they really have the NBA Draft Lottery without the Wolves?